IN THE FRAMED MAP OF THE UNITED STATES that Jamon Van Den Hoek keeps in his office, black lines crisscross the landscape in puzzle fashion. They arch around mountains, curve across rivers and skirt lakeshores. Then, they converge and cluster around big cities like knots in a shoelace. It’s a map of roads in America, he explains. Though the image is striking in its simplicity, Van Den Hoek, a geographer in the College of Earth, Ocean, and Atmospheric Sciences, knows it is out of date. The map is single and unchanging, more archive or artwork than truth. But Van Den Hoek has questions. What if a classroom could have a massive, digital projection of the map, layered with years of data on light pollution or urban expansion? What if students could explore these data at different spatial and temporal scales, witnessing landscape change in almost real time using images collected from different satellites? And what if students could then share their science and engage the public using deeply visual storytelling? Van Den Hoek is poised to bring that capability to Oregon State University. 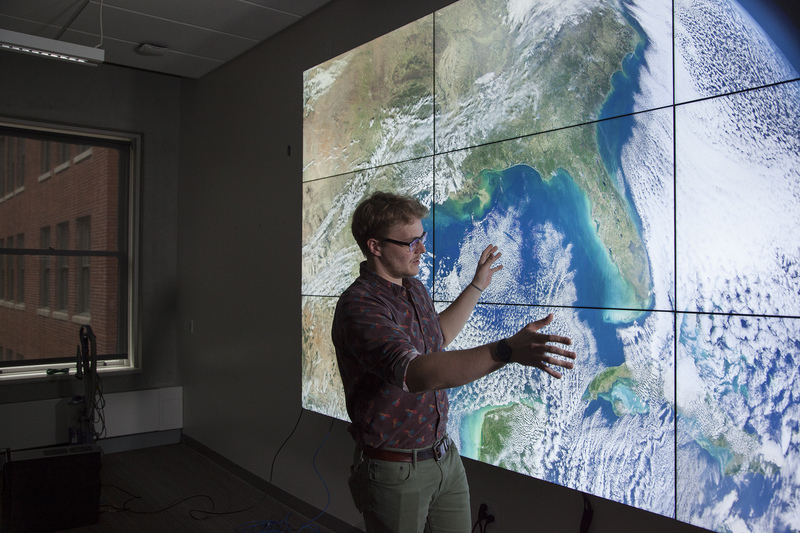 He and colleagues are spearheading the newly launched GAZE facility (Geospatial Analysis and VisualiZation for Education), a state-of-the art learning space that will allow students to explore a wide range of dynamic geographic processes and datasets. At the heart of GAZE is a 12 ft. by 7 ft. hyperwall, an immersive 3×3 grid of computer monitors backed by a distributed infrastructure that is capable of handling large datasets. Coupled to the hyperwall is an augmented reality sandbox, which allows students to create and manipulate terrain models by moving sand into hills or valleys (see “Augmented Reality Sand Table” at the end of this story). Students will not only get to explore existing digital maps of, say, forest cover over the last decade in the Pacific Northwest, but develop their own programming scripts to create original visualizations of environmental or social changes. GAZE is just one example of the innovative facilities in CEOAS that are challenging the status quo of learning about our changing planet and population. Collaborative spaces and robust computing offer opportunities for students to learn in a way they never could before — in step with planetary changes while exploring their own research questions, diving into big datasets and learning the programming languages of the pros. Together with a cluster of new hires that are breaking down disciplinary walls, students will have access to both the talent and tools to discover an unseen Earth. Geospatial facilities like GAZE owe their success to the microprocessor revolution. The miniaturization of devices has brought powerful computers into the palm of our hands, when they used to take up giant rooms. These technologies are also faster, cheaper and able to satisfy our “always-on, always-connected environment,” says Chuck Sears, head of Research Computing at CEOAS. Likewise, in the scientific world, instruments are always on and connected, collecting vast amounts of data. In many cases, instruments are able to share and send data on demand. The velocity at which this occurs has surged in the last 30 to 40 years. The end result? Emerging technologies that once were the sole province of big business have enabled the geospatial sciences to cover enormous ground, from cameras mounted on balloons more than a hundred years ago, to today’s satellites that allow us to visualize and map at scales far beyond our natural abilities. The enormity and complexity of data have driven researchers to rethink how they teach geospatial concepts. Instead of a professor serving as the knowledge authority, educators have enlisted the help of students to explore the data and search out new patterns — a new kind of all-hands-on-deck approach to data mining. Anne Nolin agrees. As a geography professor in CEOAS, she has been using remote sensing techniques since the mid-1980s while witnessing the evolution of geospatial instruction and learning. In addition to novel facilities and advances in microprocessors, software access has become fluid. As a result, students can do their work from almost anywhere. Karen Shell’s Climate Modeling class has been taking advantage. Two 60-inch, high-definition screens project a NASA climate model showing phytoplankton growth across the globe, a mass of hazy green swirling like smoke. Students huddle around computer workstations and discuss climate model datasets and Python codes. Each has been working with geospatial data to develop his or her own numerical model and unearth a facet of the climate system — where will the ocean warm the most in the next decade? The next century? And what will happen to biomass growth in a warming world? Their computers show possible answers to those questions in the form of graphs, histograms and other visualized data. What is not visible is the application that enables this kind of experiential learning. Behind the scenes, an open-source, web-based interface called Jupyter Notebook provides a platform for students to share Python scripts and code collaboratively. And soon, students will be hitching up to Jupyter through a local server, allowing them to access their codes and model runs from any computer. Where they once had to install specialized software, work from a lab or log in remotely, students will be able to easily share methodologies or compare results. Briana Phillips, a graduate student in atmospheric sciences and a NASA Earth and Space Science Fellow, has been applying concepts in Shell’s course to study the Lorenz Attractor. Otherwise known as the butterfly effect, the Lorenz Attractor demonstrates that a small change in initial conditions can cause a very different outcome. In the context of weather prediction models, it explains why it is difficult to predict the weather much more than a week out. Phillips says the Jupyter Notebook, together with the small class size, made it easier to collaborate. “This class has been my most challenging, but it’s also the class where I’ve learned the most. We do a lecture, then a lab. We can ask questions, help each other, share ideas. It’s an atmosphere really conducive to learning,” she says. Undergraduate student Matt Laffin explored what would happen to the Earth’s habitable zone if our day was cut in half. Would the Earth freeze over? Could we still live in certain places, and for how long? It might seem sci-fi, but his project provides insight into whether a newly discovered planet — with a different size, orbit or atmospheric composition — could support life. The what-if nature of Shell’s class is compelling evidence that teaching geospatial sciences has moved from inference-driven to inquiry-driven. Boundaries between professor and pupil, between disciplines, between the haves and have-nots of software access are gone. Like the static map in Jamon Van Den Hoek’s office, traditional ways of looking at our planet from a distance have been redrawn. What is left? Only the most unimagined map of the world, one that holds a story yet to be told. table at the Hatfield Marine Science Center. The cyberlab research platform is not only fun to play with; it provides a means of teaching complex concepts, in this case, map topography. Visitors can play with the sand to create hills and valleys, and the AR component projects colors corresponding to the resulting land and water elevations, along with topographic contour lines (Photo by Lynn Ketchum). Editor’s note: Abby Metzger is a communicator with the Oregon State University College of Earth, Ocean, and Atmospheric Sciences.